With delicate and whimsically soft illustrations, this book perfectly captures a toddler’s enthusiasm. 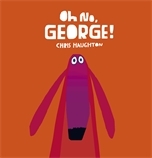 Set to a gorgeously rich colour palette of purples, orange and deep crimson, this is a delightfully playful tale with minimal text but oodles of personality that shows how the best intentions can go awry. I have GEORGE in hand and am totaLly taken with this book! Chris Haughton blog tour kicks off today! A chance to meet Chris Haughton!